Founder and President, e's Inc. Co-Founder and Chairperson, Change Agent, Inc.
Junko Edahiro is one of most prominent environmental journalists in Japan and is a major icon for slow movements in Japan. She has translated books of Lester Brown, Al Gore, Dennis Meadows, Donella Meadows, David Suzuki and many others into Japanese, and also writes by herself dozens of books on climate change, energy, happiness, systems thinking, and many other sustainability topics. She promotes and facilitates environmental communication and dialogue among governments, corporations and citizens. She also invites prominent opinion leaders from the U.S. and Europe, and resides several networking events, which attracts hundreds of business people, policy makers, researchers, and concerned citizens. With these activities, she is deemed as an icon figure of networking across different sectors. In 2002, along with other collaborators, she founded Japan for Sustainability (JFS), a non-profit environmental communication platform. JFS provides information on Japan's activities promoting sustainability on the website (www.japanfs.org) and publishes weekly digests and monthly newsletters. Serving as a Chief Executive, she has mobilized hundreds of volunteers to research, write, translate and publish 30 news articles every month on new regulations, policies, business initiatives, technology development and citizens' local initiative. JFS and its website have won several awards for advancing sustainable development. She is also an initiator of the Candle Night campaign (www.candle-night.org/en/), in which over five millions of people join to turn lights off in the night of the summer and winter solstices to think about the environment and peace. From 2002 to 2005 she founded three companies, all related to sustainability in one way or the other. e's, Inc. sells eco-products and support those who would like to transform themselves. Eco Networks, Inc. provides translation and consulting services and help Japanese corporations to conduct effective communication on sustainability and CSR. The other company is named Change Agent, Inc., and it provides consulting and education services, with tools such as visioning, systems thinking, communication and management systems. In addition, she was an advisor to Japan's Prime Minister at the "Climate Change Roundtable," preparing for the Toya Lake Summit in 2008. She has served many other government committees and corporate boards related to climate change, biodiversity, and energy issues. She speaks on sustainability outside of Japan, too – in Beijing, Bandung, London, Stockholm, Berlin, Davos and Washington DC. She has been selected as a council member of International Sustainability Innovation Council of Switzerland in 2008. She also gave a paper at the Fourth GNH Conference held in Thimphu, Bhutan in November, 2008. 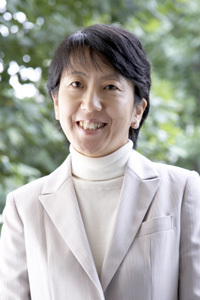 She spoke about her concept regarding a new lifestyle and mindset toward a more sustainable society as "De-Ownership, De-Materialization, and De-Monetization" at TEDxTokyo in May, 2011. She has been chosen as a most successful career woman by Nikkei Career Women magazine in 2003. She has been selected as one of the "100 Planet Earth Lovers" at the World Expo 2005 held in Aichi, Japan. Also, she was named a Prominent Woman Leader in the Environment Movement by the Health and Human Services University of US. In 2011, she founded the Institute for Studies in Happiness, Economy and Society (ISHES) to rethink on the relationship among happiness, economy, and society and explore better systems and indicators. ISHES engages in many activities, for example, seminars for thinking true happiness in relation with economy and society, and study meetings for developing dialogue skills to co-create even with people in different positions. On June 12, 2011, Prime Minister Naoto Kan met in his office with prominent experts for a discussion on the future of Japan's national renewable energy policy and she was requested her participation in this meeting. In July, she launched Minna-no [Everybody's] Energy and Environment Conference (MEEC) with a variety of organizers, aiming to create a platform where people in various positions and with various philosophies can freely talk, discuss and conduct a dialogue about the future of energy in Japan. She intends making a groundswell through MEECs held in many places in Japan, as well as playing a role in creating and connecting processes for change in which each of us could think the most important question as one's own problem, "what is the truly desirable energy for our society?" and act for it. In 2013, to comprehensively study the relationship among happiness, economy, and society and work on these themes, she holds workshops on happiness and sustainability. She organizes a website "e's Future Co-Creation Forum" to co-create new value from finding relationships among factors within a problem. She contributes to co-creation of happy and resilient future through human connections and dialogue. She worked as the professor of the Department of Environmental Management, Tokyo City University from September 2014 to March 2018. She was appointed as a professor, Department of Leadership and Innovation, Graduate School of Leadership and Innovation, Shizenkan University in April 2018. "Toward an Era of Servicing Economy"
"To Promote Collaboration with Citizens"
"What We Can Do to Conserve Nature and the Earth"
"Environmental Initiatives and Trends in Japan." "Movements and Cases for Sustainability in Japan." "Using Systems Thinking and Modeling Insights to Create Change in Japan." "Japan's stories toward a sustainable society." "A Philosophical Approach to Addressing Global Environmental Issues"
"Towards Biodiversity Conservation in Japan"
"Vision for a Low-Carbon Japan: Cutting Carbon Emissions 60-80 Percent by 2050"
"Local Governments' Goals and Measures in Anti-Global Warming Campaigns"
"The Rebirth of Trams: The Promise of Light Railway Transit (LRT)"
"GPI, GNH, GCH: True Indicators of Progress"
"Artists' Movement for a Better World"
"The End of Growth: Efforts in Japanese Society and Business to Slow Down"
"Locally Sustainable Economy Supported by Community Currency"
"Rebuilding Every 20 Years Renders Sanctuaries Eternal - the Sengu"
"'Teijo-Keizai' wa Kano da" ('Steady-State Economy' Is Possible, published by Iwanami Shoten in 2014)," by Herman Daly and Junko Edahiro and more. Brown, L. 1998. Revolution for Eco Economy. Trans. Edahiro, J. Tokyo, Japan. Tachibana Publishing, Inc.
World Watch Institute. 1999. State of the World 1999. Trans. World Watch Japan. Tokyo, Japan. ISS Corp.
Meadows, D., Meadows, D. and Randers, J. 2005. Limits to Growth: The 30-Year Update. Trans. Edahiro, J. Tokyo, Japan. Diamond, Inc.
Gore, A., 2007. An Inconvenient Truth: The Planetary Emergency of Global Warming and What We Can Do About It. Trans. Edahiro, J. Tokyo, Japan. Random House Kodansha Co., Ltd.
Sterman, J., 2009. Business Dynamics: Systems Thinking and Modeling for a Complex World. Trans. Edahiro, J. and Oda, R. Tokyo, Japan. Toyo Keizai Inc.
Meadows, D., 2009. The Message from Professor Donella H. Meadows. Trans. Edahiro, J. Tokyo, Japan. Random House Kodansha Co., Ltd. Resurgence magazine, 2009. The Anthology of Resurgence Magazine: Toward an Era of Reconnection: Environmental Thoughts and Actions Aiming for a Sustainable Society. Trans. Edahiro, J. Tokyo, Japan. Otsuki Shoten. Gore, Al, 2009. Our choice: A Plan to Solve the Climate Crisis. Trans. Edahiro, J. Tokyo, Japan. Random House Kodansha Co., Ltd.
Senge, P. M. 2011. The Fifth Discipline: The Art and Practice of the Learning Organization. Trans. Edahiro, J., Oda, R. and Nakakoji, K. Tokyo, Japan. Eiji Press Inc.
Brown, R. R. 2012. World on the Edge: How to Prevent Environmental and Economic Collapse. Trans. Edahiro, J. and Nakakoji, K. Tokyo, Japan. Diamond, Inc.
Gore, A. Jr. 2013. The Future. Trans. Edahiro, J. and Nakakoji, K. Tokyo,Japan. Kadokawa Corporation. Gore, Al, 2017. An Inconvenient Sequel: Truth to Power: Your Action Handbook to Learn the Science, Find Your Voice, and Help Solve the Climate Crisis. Trans. Edahiro, J. Tokyo, Japan. Jitsugyo no Nihon Sha., Ltd.